A singer, 70 voices, and a story to remember at the Bankia Príncipe Pío Grand Theater. After acting in London, New York, Miami, Dubai, Buenos Aires or Paris, "El Imitador" returns to Madrid, the place where everything began, to travel through his memories through music. The songs that were part of his story will give him an answer to something that until today he did not understand completely. 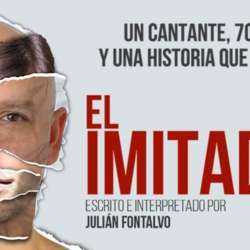 The actor and singer Julián Fontalvo returns with his second self-created show "El Imitador". His show of imitations "The voice" has been represented in 21 countries around the world. In it, the artist makes a display of his vocal skills imitating up to 25 international singers in just 8 minutes. In "El Imitador", Julián imitates 70 different artists such as Sting, Macaco, David Bowie, Andrea Bocelli, Celia Cruz, Amy Winehouse or Tina Turner, among others. This show directed by Jesús García, with whom he worked in his previous show "Gin & Tony", proposes at the same time a personal journey for each spectator, who will recreate the soundtrack of his/her life while attending the memories of El Imitator.